An all-in-one meal that’s portable, filling and delicious. Tip the flour into the bowl and add the shortening, a pinch of salt, the margarine or butter and all of the water. Use a spoon to gently combine the ingredients. Then use your hands to crush everything together, bringing the ingredients together as a fairly dry dough. Turn out the dough onto a clean work surface (there’s no need to put flour or oil onto the surface because it’s a tight rather than sticky dough). Knead the dough to combine the ingredients properly. Use the heel of your hand to stretch the dough. Roll it back up into a ball, then turn it, stretch and roll it up again. Repeat this process for about 5-6 minutes. The dough will start to become smooth as the shortening breaks down. If the dough feels grainy, keep working it until it’s smooth and glossy. Don’t be afraid to be rough – you’ll need to use lots of pressure and work the dough vigorously to get the best results. When the dough is smooth, wrap it in cling film and put it in the fridge to rest for 30–60 minutes. While the dough is resting, peel and cut the potato, swede and onion into cubes about 1cm/½in square. Cut the beef into similar sized chunks. Put all four ingredients into a bowl and mix. Season well with salt and some freshly ground black pepper, then put the filling to one side until the dough is ready. Lightly grease a baking tray with margarine (or butter) and line with baking or silicone paper (not greaseproof). Preheat the oven to 170C (150C fan assisted)/325F/Gas 3. Once the dough has had time to relax, take it out of the fridge. The margarine or butter will have chilled, giving you a tight dough. Divide the dough into four equal-sized pieces. Shape each piece into a ball and use a rolling pin to roll each ball into a disc roughly 25cm/10in wide (roughly the same size as a dinner plate). Spoon a quarter of the filling onto each disc. Spread the filling on one half of the disc, leaving the other half clear. Put a knob of butter or margarine on top of the filling. Carefully fold the pastry over, join the edges and push with your fingers to seal. Crimp the edge to make sure the filling is held inside – either by using a fork, or by making small twists along the sealed edge. 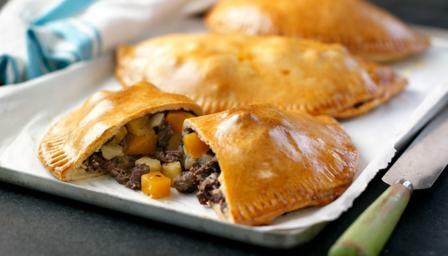 Traditionally Cornish pasties have around 20 crimps. When you’ve crimped along the edge, fold the end corners underneath. Put the pasties onto the baking tray and brush the top of each pasty with the egg and salt mixture. Bake on the middle shelf of the oven for about 45 minutes or until the pasties are golden-brown. If your pasties aren't browning, increase the oven temperature by 10C/25F for the last 10 minutes of cooking time.